Quirky containers. Don’t these look excellent? 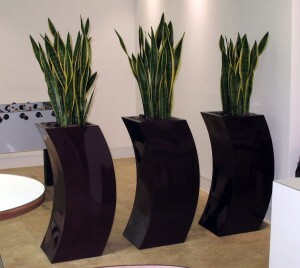 The plants are Sansevieria laurentii and the containers black curved fiberglass towers, 12″ wide x 30″ high. They create a great screen, as well as a talking point! Today. containers come in so many forms not just round or square. As with technology, today’s décor is becoming that of very a smooth, minimalistic, pure color design. This is often referred to as a Japanese style of design. Aside from the modern and decorative designs, commercial planters nowadays are also more functional than before. They can now have self-watering features, may include sub-irrigation systems for root growth, and can be made of durable materials. This will reduce the need for frequent watering and and cut down on the costs of maintaining the health of your plants. One of the most popular of the “new” style pot is the Contemporary Twist Modern Planters. It has sophisticated design that can match even the interiors of your office. Your plants will never be out of style with these kinds of commercial planters. Another is the illuminated modern planters that are also becoming a favorite today. They are internally lit which can be an excellent source of light for your room, poolside, or even in the walkway. Growing Expectations prides itself on the unique commercial planters they use in their designs. We are the East Coast distributors of illuminated modern planters. For more information on our unique and innovative planters contact Growing Expectations and schedule a consultation at info@interiorofficeplants.com.